With Vinland Saga, vocalist Liv Kristine Espenæs Krull (Theatre Of Tragedy), once again supported by the band Atrocity, creates a concept album with ties to ancient Nordic history. The CD explores Viking contacts with North America. Vinland is the southernmost of three North American coastal areas – these areas were described in several Icelandic sagas, such as The Greenlander’s Saga and Eirik’s Saga. Although Bjarni Herjolfsson was the first to sight North America, it was Leif Eirikson whose voyages are recorded in the Vinland sagas. Although Leaves’ Eyes remains overtly melodic and romantic, the band has moved away from its gothic-metal roots, exemplified in the debut Lovelorn, and has created its own signature sound, which incorporates elements of symphonic power metal with Scandinavian folk music. There’s no simple way to categorise this sound. Listeners must experience it, and once swept in the icy waters of this siren’s seduction, there’s no looking back. 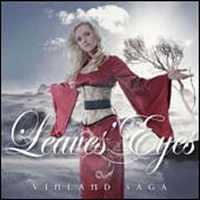 Leaves’ Eyes power now resides in the voice of Liv Kristine. Although she continues to use her soft soprano voice in solo or ‘beauty and the beast’ duels with her husband and producer Alexander Krull (who uses a traditional death-metal based growl, although it is toned down on this release), she also has cultivated a more power-metal based sound for some of the compositions, as well as a powerful operatic voice (in evidence on the opening title track and on Solemn Sea). This new infusion of power brings to life the vocal prowess of Liv Kristine, and long-time fans will rejoice at this new dynamic range. It’s as if Liv has found her niche in music – her revitalised energy is channeled through an extremely powerful but sensual voice. As for the band, it also has moved away from gothic trappings and has cultivated a bombastic sound inspired by Nordic folk music and orchestral scores. Tracks such as Farewell, Proud Men, New Found Land, and Misseri (Turn Green Meadows Into Grey) resonate with symphonic touches (Troldhaugen comes to mind), as well as power-driven guitar riffs courtesy of Torsten Bauer and Mathias Roderer. Mastermind and producer Alexander Krull handles the programming, whereas bassist Chris Lukhaup and bassist Moritz Neuner establish a rhythm section filled with complex rhythms, driving percussive bursts, and intricate fills and throbs. Not to worry, for the band still embraces beauty and melody. Tracks such as Elegy, Amhran (Song Of The Winds), and Leaves’ Eyes are incredible ballads that showcase Liv’s enthralling voice. Still, it’s nice to have some driving aggression as well, and tracks such as Solemn Sea and The Thorn (both featuring Krull’s harsh vocals) do not disappoint. Very few will doubt that Liv Kristine is indeed one of the first ladies of metal, but with Vinland Saga, Leaves’ Eyes now stands apart from the gothic-metal sound and creates its own distinct atmosphere. I intend to listen to this one for a long time indeed.